Detect distance, ambient light and time-delay are adjustable, you can make your own setting. Microwave Radar Sensor, 360° wide angle detection and further detection distance, can penetrate glass and veneer. Applicable to monitoring equipment, warning facility, LED lamp, fluorescent lamp, incandescent lamp, ventilator and magnetic valve and so on. Well suited to circulation areas, integral garages, store rooms, toilets, kitchens, common stairs wells or corridors where there are frequently people passing in an out of an area and the lighting often gets left on accidentally. Can be installed on wall, ceiling and anywhere of your house. Wide Detection Range: 1-8m adjustable, Can be adjustable. 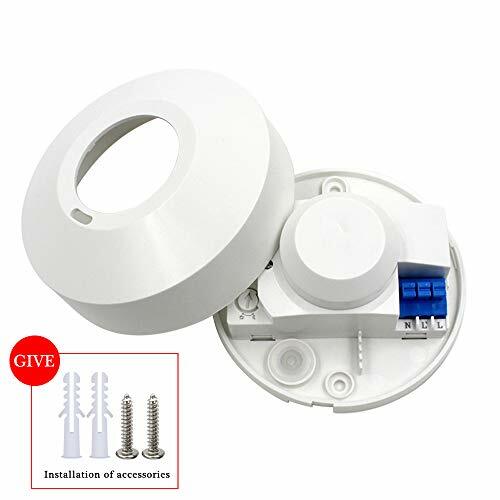 Light Sensor: 2-2000Lux adjustable, This motion sensor switch can work in day and night. Wide Application: Can be connected with energy-saving lamps fluorescent lamps LED lamps and other lamps. Support used in inserted lighting, stairways, porch, corridor, bathroom and garage. Warranty: We do not sell perfect pictures but goods, We supply full refund or reshipping new product if you are not satisfied with our products. If you have any questions about this product by RUISI, contact us by completing and submitting the form below. If you are looking for a specif part number, please include it with your message.